Thanks to the revolutionary CEREC computer-aided design and manufacturing system, the professionals at Dr. Gallant’s dental clinic are able to create and place a crown in a single appointment. CEREC is an ultra-modern technology that uses biomimetic ceramic materials assembled by bonding to dental surfaces in order to preserve the vitality of treated teeth. CEREC is the acronym for Ceramic Reconstruction, a computer-assisted restoration method using a ceramic block. CEREC gives you the advantage of crown placement in a single appointment, which saves you time and money. Opt for CEREC and have a crown placed in a single appointment, and get the relief you need. Unlike traditional crown treatments, CEREC crowns require only one anesthetic for complete treatment. 1. The dentist will treat and prepare the defective tooth. 2. An optical impression is made using CEREC. 3. The ceramic restoration, made with CEREC 3D, is cemented to the prepared tooth. 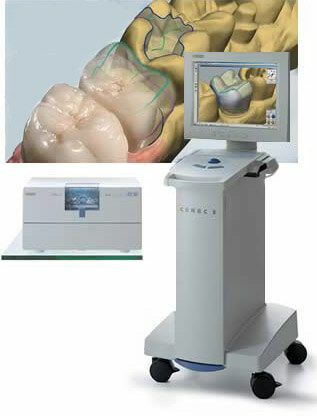 Contact us today for a consultation to discuss CEREC technology.